Japanese superstar singer Yamazaki Masayoshi X Nagamoto Tomori are joining forces once again only for Yamazaki’s very first hall-class concert in Kurayoshi, Tottori. Kurayoshi is the town where once Tomori has set his studio in 2015, to develop a concept for the Lyric Is Poem exhibition and create artworks with a group of friends, colleagues, and family. 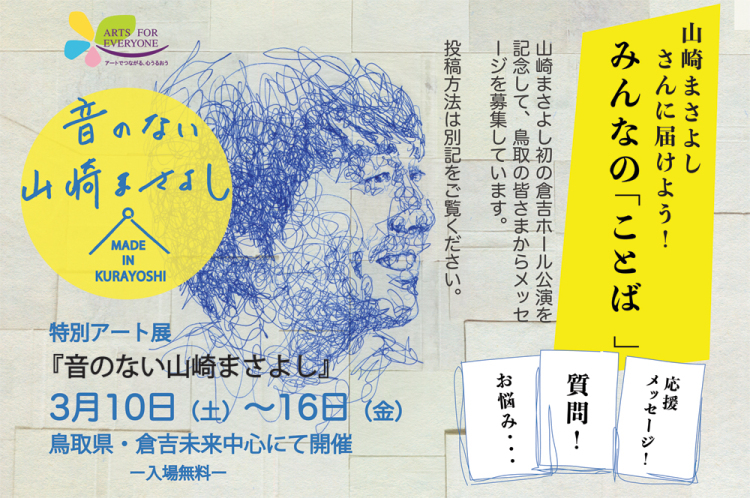 The exhibition will take place in the Tottori Prefectural Kurayoshi Mirai Chushin from March 10th to 16th. この記事を共有する "the 2nd “LYRIC IS POEM” exhibition 音のない山崎まさよし- MADE IN 倉吉-"